If you’d love to Bible Journal, but don’t quite know where to start, this post is for you! 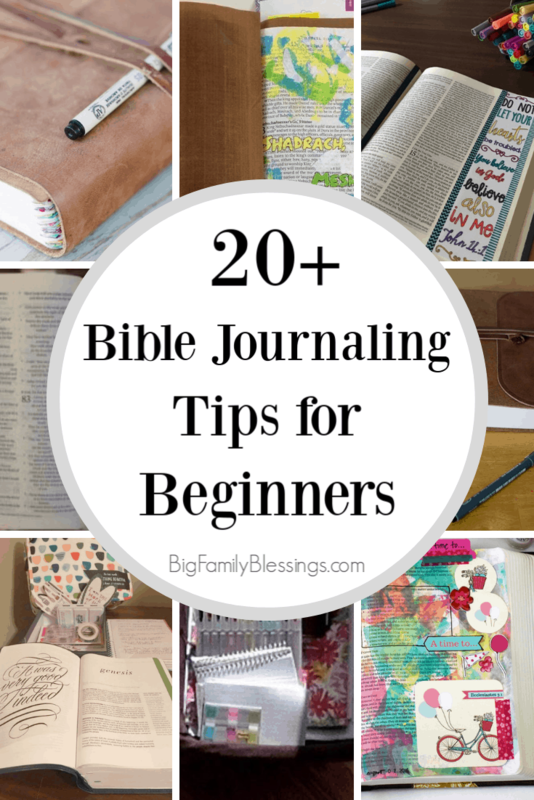 Begin with my post, Bible Journaling for the Beginner which will help you get started and explains 8 different ways to use your jouraling Bible. This post from Christa Sterken has more good tips for beginners with several easy to follow examples. Here is a step by step post by Arabah Joy on how to get started Bible Journaling. Still trying to decide which Journaling bible to buy, check out this post from the Holy Mess. If reading and understanding your Bible feels difficult, this post with 5 great tips from the Awe Filled Homemaker will help. This great post by Equipping Godly Women will help you make Bible reading a daily habit, along with some Bible journaling tips. Easily distracted while trying to read your bible, Bible journaling can help and this post will tell you how. Sometimes the most difficult part of Bible journaling is simply deciding what Bible verses to read. This 30 day Bible reading plan from Dawn Klinge is full of great scriptures for journaling. Plus since it assigns just a chapter a day, you’ll have plenty of time to reflect and journal on what you’ve just read. This Bible reading plan from The Holy Mess will lead you along 30 days of knowing your identity in Christ. Here are seven more great verses to journal from The Holy Mess. Using your Journaling Bible through Advent is a great way to focus on THE reason for the season! Check out this post by the Awe Filled Homemaker to get started! If you’d like help deciding what techniques are right for you these posts will help. If you aren’t very artistic, this post will teach you many simple ways to journal in your Bible. This post by Kristi Dee has more simple Bible journaling tips to get you started. I really love the idea of micro Bible journaling, and this post will teach you all about you. Now, if you want tutorials on specific techniques or pages to journal, this post from A Cup Full of Sass has a fun printable you can washi tape into your Bible after following the tutorial on using acrylic paints and a credit card in your Bible. What supplies should you buy for Bible Journaling? You really don’t need anything more than a good pen and a few colored pencils, but if you are looking to splurge a little and buy a few fun things this post will help. Maybe all of this seems overwhelming? This post will make Bible journaling simple and help you get started immediately. Now that you have everything you need, how about a great DIY organizer for your Bible? Bible Journaling is such a great way to study and worship! I can’t wait to hear how much you love it too! Thanks so much for including my Bible journaling post! Thank you for the shoutout Amanda! Have a WONDERFUL day!